Long before I lived in San Diego in the late 80’s, Puerto Vallarta was already synonymous with the ideal Mexican vacation. Friends of mine who already lived blocks, not miles, from Pacific Beach and the cliffs of La Jolla would go to Puerto Vallarta for vacation (one just can’t have too much sand, sun and ceviche). Puerto Vallarta began to sound like an extension of Southern California to me, so comfortable were they there. Even after I moved to Mexico what I read about Puerto Vallarta led me to continue to believe that the port town wasn’t like the rest of Mexico. Unlike Mazatlán, where I presently live, tourism took the place of fishing as Puerto Vallarta’s top industry decades ago. Pictures promoting Puerto Vallarta show upscale restaurants, art walks and zip-lining through the jungle, reinforcing the impression of one colossal resort, a gigantic Mexican version of the Gaylord Opryland Convention Center in Nashville, an all-inclusive resort enclosed under a biospheric dome. Expat friends who know Puerto Vallarta well come back describing it as increasingly posh due to the influx of expats, especially homesteaders from the gay community (Puerto Vallarta has been described as Mexico’s San Francisco) with their reputation of knowing how to raise property values. As my Mexican friends put it (which makes me laugh every time), Puerto Vallarta is bien nice. Even crazier, I have actually been to Puerto Vallarta and to Sayulita several times years ago. My vision, I realized, was completely inaccurate. I knew objectively that Puerto Vallarta was just as “Mexican” as Mazatlán up the coast, yet I couldn’t shake the mental images that looked nothing like what I know about Mexico. What I liked about Katie O’Grady’s blog Los O’Gradys in Mexico and her experiences raising her family was that her accounts jibed with the Mexico I know (though admittedly not as well as she does); the Mexico where family members really do like each other; the Mexico where teenagers are perfectly happy being towed around by their mothers on social calls, and where grandmothers, young parents, aunts and babies would rather spend their time together, even on a Saturday night, than anywhere else. Katie, her husband, and their twin redheads live outside Puerto Vallarta proper in Nayarit, a clear indication that what she and her husband sought for their young family was not the protection of an expat enclave but rather the Mexico I experience whenever I spend time with my Mexican friends in Mazatlan, a Mexico in love with the moment. She recognized in time that the quality of bond common between children and their families in Mexico is not created by two people working 11-hour days and propping children on the couch with their smartphones while the exhausted parents come home after a long commute and try to pull a dinner together. Having the good fortune of Spanish skills from her teaching career and a husband who could retire at 50 as a fireman, the two decided they still had the lung capacity to blow more life into their family’s future by learning to savor the slower richness of life south of the border. You may wonder what you have in common with a young family who pulls up their tent and moves to Mexico. I did. I live in Mexico, love Mexico, and what they did seemed extreme even to me. But there is a purity to people’s hopes for their children. People will do things, fight for things for their children that they otherwise might not for themselves. Children serve a valuable motivational function. They drive adults to go back to college, to bear horrible jobs, and to be better people. They wanted for their children what we all want for ourselves but get too tired to fight for; the chance to live our lives with a sense of wonder and peace, and to be able to drive adventure into our days, or conversely, slow our lives down enough to be able to better recognize and examine the quiet moments of grace when they happen. “We wanted our children see that it is not only okay, but of great value to slow down and pay attention to the details, to relish and thrive in the here and now, to be alive and awake to the magic of the moment," Katie writes in in her Huffington Post article "We Left The American Dream to Raise Our Children in Mexico" "to value conversation and interaction that does not involve tuning the world out behind a computer screen.” What the O’Gradys wanted for their children was no different with many people's very adult dream of escaping from the American Rat Race. Who could not want the same for themselves? I have written that if the American Dream includes financial security, good healthcare and surroundings that nurture creativity, most of us will need to move to another country to achieve it. In Mexico, the O’Gradys and at least a million other Americans have traded the tired canard for the real life of time on the beach, exploring an ancient and vibrant culture, and having chilaquiles for breakfast. Katie provides concierge-level assistance to individuals and families wanting to move to Mexico, from family services to meeting healthcare needs. She is listed as a primary contact and rental concierge for Puerto Vallarta and its surrounding areas in If I Only Had a Place, a guide to renting in Mexico. Get a glimpse of Oaxaca through the eyes of one of its artists. Guadalajara, the big-city choice for expats wanting more than a beach. Puebla - Spanish roots and an undiscovered gem of history, food and proximity to Mexico City. Mérida - Insights from the Yucatan pennisula. San Miguel de Allende - Awaking the creative in Mexico’s popular expat town. Kerry Baker is the author of two books, the Interactive Guide to Learning Spanish Free Online and If Only I Had a Place. The Interactive Guide is a a curation of the best free tools for learning Spanish online, currated into lesson plans by level. Use these level plans, or create your own from the hundreds of resources included in this book. 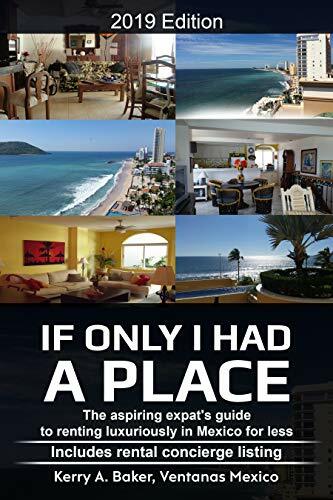 If Only I Had a Place is your complete guide to renting luxuriously in Mexico for less. Renting in Mexico has both risk and opportunities. Learn how to best position yourself for the most rewarding expat life, and how where you live makes all the difference.